It took nearly 10,000 years of breeding to take maize from a tropical crop with thumb-sized ears to the high-yielding Midwest crop of today. But in just the next decade, new corn varieties will likely have higher levels of vital nutrients, handle drought and temperature extremes better, and produce yields more efficiently. How will these changes happen so quickly? The short answer is genomics. Genomics is today's buzzword when it comes to scientific progress, but what does it really mean? To answer that question, we need to take a few steps back. Most people recognize the term "DNA"—the iconic double helix in the cells of all living things. DNA makes up an organism's genes. All of an organism's genes together comprise a set of instructions, a "recipe" for making that particular species or variety. This is the genome. Genomics is also the science of connecting genes with the physical traits or processes they control. Genomics is also the panoramic view of an organism's entire DNA landscape, not only how DNA works, but also how the genome interacts with its environment and how environment acts on the genes. Scientists are studying all types of genomes to unlock the codes to specific traits. Agricultural Research Service (ARS) scientists are using genomic information to solve fundamental agricultural and environmental problems. Sometimes, rather than figuring out a whole genome, it is easier to identify stretches of DNA known as "genetic markers" that are associated with particular physical traits. A genetic marker is not necessarily part of the gene controlling a trait, but it is always associated with the trait. Finding a genetic marker can be faster than sequencing a genome, since it only requires identifying a short DNA sequence rather than millions of genes and their functions. Before use of genetic markers and genomics became practical, researchers and breeders trying to breed in improvements were mostly working in the dark—or at best working with indirect physical evidence. They could only select parents that exhibited, or "expressed," the desired trait and then hope the trait would pass to the next generation. Usually, researchers bred thousands of combinations for every one or two successes. "What genomics really means is having a powerful spotlight," explains Jack Okamuro, ARS national program leader for plant genetic resources, genomics, and genetic improvement. "It shines a spotlight of precision so a scientist can get a much better fix on what genes need to be in the offspring." For example, ARS scientists found markers for a valuable gene that gives wheat resistance to the Hessian fly. To ensure that the resistance trait is successfully bred into new wheat plants, researchers need only to look for the genetic markers. This cuts years—if not decades—off the process of conventional breeding. Similarly, when ARS vegetable researchers wanted to breed broccoli that could be grown in warmer temperatures, they identified genetic markers associated with heat resistance in a test group of broccoli plants. These markers will speed the development of heat-tolerant broccoli cultivars. 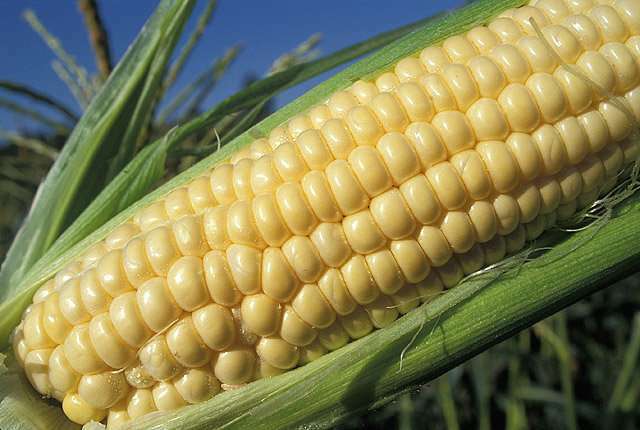 In the case of maize (corn), ARS geneticist Edward Buckler has developed an encyclopedic amount of information about the crop's 40,000 genes and the nearly 2.3 million pieces of genetic information about specific physical traits, such as flowering time, yield, and cold tolerance. And the knowledge base continues to expand. Buckler is part of a team that recently analyzed 4,500 maize varieties bred and grown by farmers across the Americas to find the genes that let corn adapt to different latitudes and elevations. "We found that there are a thousand genes attuning a maize plant to a particular latitude and elevation," Buckler says. "But we found them." "Genomics provides us the knowledge and precision to combine the best genetics, whether from the Tropics or the Midwest, to get a new variety with exactly the traits to do the job we need it to do—and to do the combining in just a couple of years, rather than in a decade," he adds. Sequencing a genome spawns an enormous amount of data. As technology's power to produce genomic information grows, ever more data is generated, and new approaches are needed to manage all of it. In the case of insect genomics, research is further complicated by sheer numbers. There are millions of insect and arthropod species, many of them with profound importance to people and to Earth's ecology. Insects pollinate a third of our food crops, yet some can cause considerable damage to crops and livestock—and big revenue losses for producers. Pesticide resistance is an evolving problem too. Understanding an insect pest's biology is essential to finding ways to combat it without harming other species. Better solutions to these problems are to be found in the genomes of pests and their hosts. Yet, the vast diversity of insect species means fewer scientists and resources to unlock their genomic secrets. Developing and maintaining genomic databases is often beyond the financial and technical reach of those smaller scientific communities. In answer, an international group of scientists, co-chaired by ARS national program leader Kevin Hackett, organized the i5k Initiative to sequence and analyze the genomes of no less than 5,000 important insect species. The initiative leverages resources by virtually bringing together scientists from all over the world and from different disciplines, such as molecular biology, genetics, physiology, bioinformatics, and database management. It has fostered discussions about how to reduce redundant research efforts and provide feedback about funding priorities. Far from being ivory tower exercises, i5k insect genomics efforts are leading to advances that play right into today's headlines. A big spike in tick numbers in the summer of 2017 put ticks high on the season's list of media topics, and ticks are also among the successes associated with i5k. When ARS insect physiologist Felix D. Guerrero and his team sequenced the cattle tick genome, which is about 2.5 times the size of the human genome, they identified genes they are now using to develop a new vaccine against cattle fever ticks. This vaccine may protect cattle from several fatal diseases spread by the tick. The proteins these genes control are also being tested by ARS entomologist Andrew Li for control of ticks harboring bacteria that cause Lyme disease. 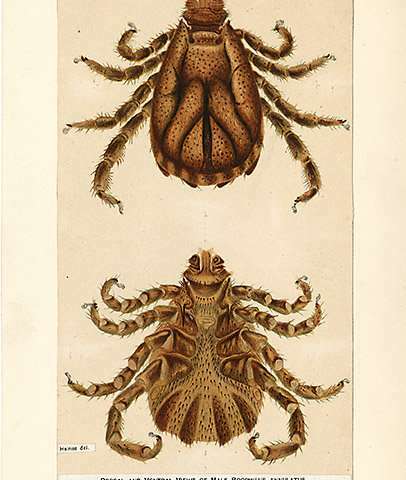 Li hopes that when these ticks bite mice and rabbits given the proteins, the ticks will die. White-footed mice and rabbits are hosts for early stages in the tick life cycle. Parallel with the i5K initiative, ARS's National Agricultural Library (NAL) has organized the "i5k Workspace@NAL" to provide a common online area where researchers can work together on genomes, piecing together data using internationally standardized genomics software. This ensures the widest possible access to the data and more long-term stability for genome databases. "Scientists—and others—see i5k Workspace@NAL as neutral ground. We have been able to draw together groups into broad international collaborations working on common data sets, efforts that would be more difficult, if not impossible, with smaller databases, each focused only on a single species, at risk of disappearing every time someone retires or changes positions," explains computational biologist Christopher Childers, one of the project co-heads. 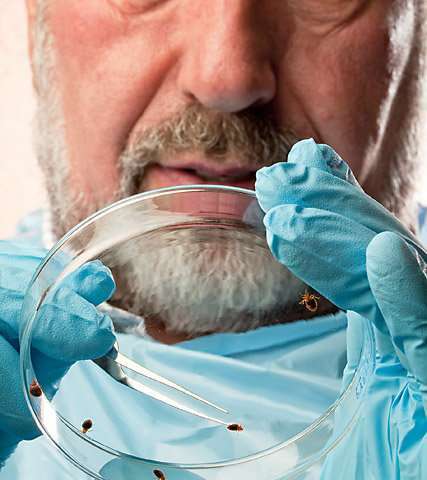 A recent example of the i5k Workspace@NAL's success is the publication of the bed bug genome. In April 2017, more than 60 scientists from 7 countries and institutions in 16 U.S. states, including ARS, collectively published an analysis of 14,220 genes in the bed bug's genome. 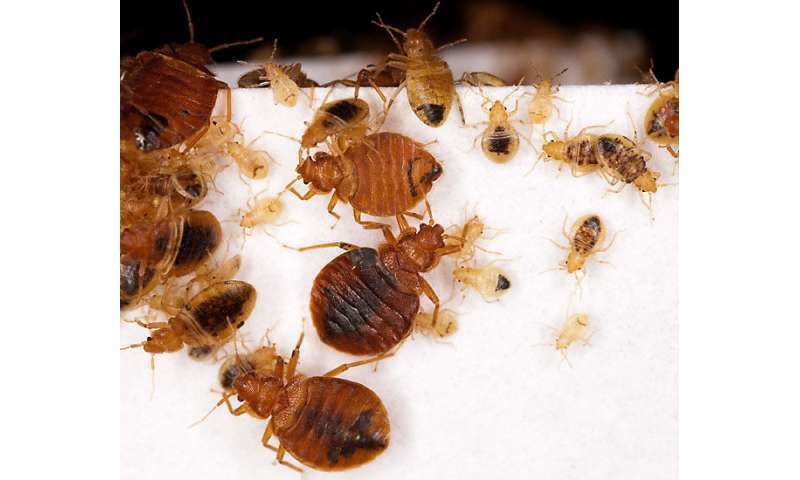 This research has laid the foundation for new methods for controlling bed bugs. Genomics today lets scientists "play poker" with more cards turned face up instead of betting into the complete unknown. And that greatly increases the odds of success in solving today's most pressing agricultural problems.